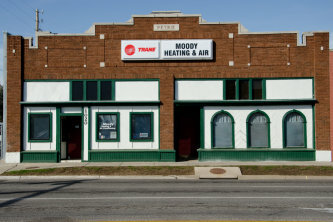 Moody Heating and Air Inc.
At Moody Heating and Air Conditioning, keeping you and your family comfortable and safe, no matter what time of year, is our business and our passion! Our staff of friendly professionals continually strive to provide the highest level of service, integrity, and competency for each and every customer we work with. 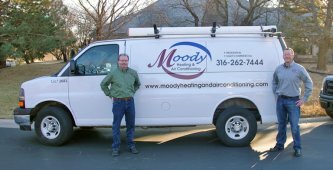 Whether you are looking for qualified service professionals, one time or annual equipment safety and efficiency tune-ups, or recommendations based on your input for which heating or air conditioning system that will best keep your home environment at the optimum comfort level, you can always count on Moody. From start to finish, we keep your needs in mind and will always make your complete satisfaction our goal. We also carry indoor air quality products for those of you who want to breathe healthier air. Obligation-free estimates, for the supply and installation of the most appropriate equipment for your needs. Ask us about the Trane 12 year parts and labor warranty on all Trane equipment. We are a Trane Comfort Specialist Dealer. We supply Trane's CleanEffects Whole House Air Filter Systems! Good Quality Work is the Bottom Line. Call us for your heating and air conditioning needs! An independent Trane Comfort Specialist™ Dealer.